Again and again I'll say that freshness is good in anything you can think of. Since we are here because of the games, we'll focus on the freshness of in the genre. And this time I did find some. 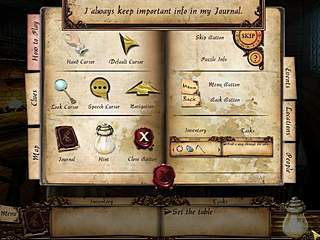 Lost Chronicles: Salem is a newly released game to the hidden object/adventure genre. You are taken to the events of 1692 which wasn't the best year for witches. It creates the feeling that the events are going on right now at the moment of playing. You play as a relatively little girl, whose mom is accused of witchcraft. And all of that happens in 1692, so your mom does need some help if she doesn't want to be tortured. The following things you come across in the game point out that the family does have something to do with some sort of witchcraft. So the adventure starts when you run away from the hands of the guards which came for your mom and then go to the prison to rescue her. The graphics are really beautiful and detailed and animated. If this part of the game is important for you, you will enjoy it. The voice-overs are just as great with a good English accent. What I noticed very soon is that the game doesn't make a clear separation between the story telling, puzzles, hidden object levels, and interactive adventures. It is awesome because it creates a feeling of something new withing a same old genre. One of the examples is when I started the first hidden object level, which was in the part of the arrest of the mom, I wasn't allowed to finish it because they wanted to burn the house, so I had to run away for ascape. That was neat. It creates the feeling that the events are going on right now at the moment of playing. 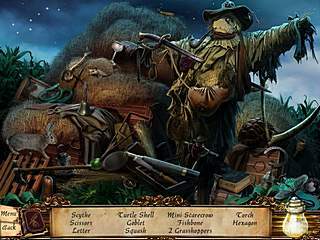 The hidden object levels are somewhere in the middle as for the difficulty level. When you are stuck you can use the hint that is a bunch of fireflies. When you do too much of random clicking you are punished with a disabled cursor for a short period of time. Then there are also mini-games nicely intertwined into the general story. There are also many inventory items that you pick up and use along the way. Those can also include some puzzles. Even though the game might have some minor flaws, it is very full of everything to be a great product on the market today. The game is a good way to kill a few hours and take a break from the reality. 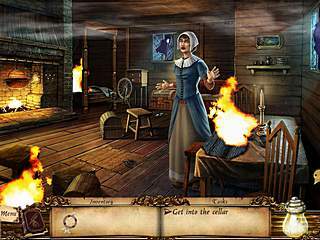 This is Lost Chronicles: Salem review. Download this game here.